Corsa Capital Investment Corporation was founded in 2007 by a group of professional traders in the foreign currency exchange market.We offer our clients the ability to make arbitrage transactions on FOREX by purchasing fixed maturity option contracts, one of the most advanced technologies in foreign exchange dealing today. 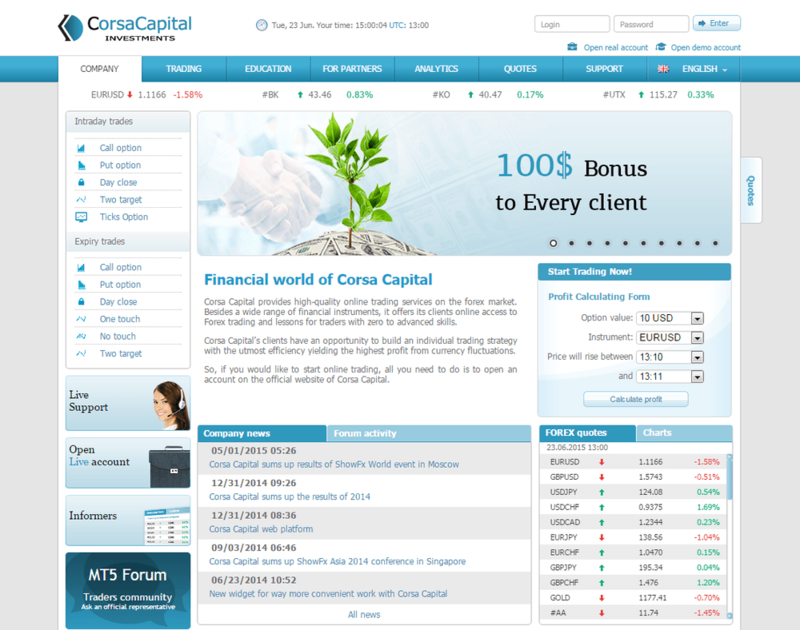 Providing this high quality new technology for operating on the foreign currency exchange market, Corsa Capital strives always to meet the level of current standards for client service in internet trading.Client accounts are set up to work in a way that maximizes the speed of shared payments and professionally trained specialists in our consulting center are always willing to provide complete technical support. I've been using Corsa Capital for about six months. Account set up was straightforward. I opened a live account with $340 and then trade with this almost six months I made around $1400 profit because their option trading platform works perfectly. Over that time I made 4 withdraw through WebMoney and all the time my withdraw was takes one day to be processed. I don’t have any complain about their service. Before Corsa I was try more than 3 other option trading brokers but it’s better than best. They give me $100 dollar bonus for first signup this that was remarkable. As far as trading goes their option trading platform is outstanding clean charting and easy to navigate. Two months ago I have invest $800 and every month I gain around $300 regularly. First time was an error from their payment processor. Once all my documents was approved by verification department my withdrawal was processed within one day with no issues. Dear traders, I am satisfied after trading with Corsa Capital Broker. Here I have deposited $100 in an account. Here I have preferred to forex trade but frequently I have to do binary options trade. I found their platform is advance with many trading tools and here my orders executed within seconds. Beside their web-Trader platform are too good. Corsa Capital has transparent payment service, as they payout level is 100%. So I am satisfied with Corsa Capital Investment Ltd.
Corsa Capital is a pretty decent broker. Based on my experience, the order execution is not instant, but still fast that I still get the price I want. The platform is usually stable except during news releases. During that time, the platform freezes for a few seconds. So most of the time,I just don't trade during news release because it becomes riskier when the platform is unstable. But aside from that, it performs well on normal market condition and it provides accurate signals. Corsa Capital has a client-friendly trading environment. It has stable platform with indicators and chart analysis that help traders assess the market trend. But I am most impressed by their instant execution. I never had to worry about sudden price change because my order is executed as soon as I click it. They also process the withdrawals quickly. Last month, I withdrew $230 and it was transferred to me in just a few hours. My experience so far with this broker has been smooth and problem-free. I really like my trading experience with Corsa Capital. Their platform is very stable. I never had issues like suddenly disconnecting, delay in execution, or the platform freezing. Their trading condition really is the best for me. However, their withdrawal process is not consistent. There are times when the transfer is done within just 48 hours. While there are also times when it takes a week before it is transferred to me. But when that happens, their customer support is reliable giving me regular updates regarding the status of my withdrawal. They never left me wondering what's happening with my money. Corsa Capital is very professional broker, I think no other brokers were better than them. The trading platform they used is very simple and also without interruption, in addition they also provide trading news updated every time without repetition. I have joined more then 2 years and always feel the smoothness of the trading process. Even their minimum account size just $1 but this broker has a good trading platform, not a lot of distractions and provide timely profit about 30% to 50%. When experience difficulties, I always connect the operators they were ready to help with a good and very fast execution. I highly recommend you all to join Corsa Capital. Who want to do binary options trading, let follow my trail of success with Corsa Capital broker. Are you afraid? how could it be possible? I say my story that I have earned four times in a row and lose three times in a row. Actually Corsa Capital has a lot of tutorial videos on YouTube and website on how to trade and I have to follow them. At beginning, I got $100 USD as no deposit bonus on my trading account. I used their web-Trader platform and here they provided a Wide range of trading tools. Till now I have profited $400 from 60-second options trading with them and I can be got 80% payment. Actually, I am comfortable in binary options trading with Corsa Capital broker. So I never thought to leave them.